Independence Day is a day to remember and give thanks to our forefathers who, in the face of immeasurable odds and conflict, acted with conviction to establish the blessings of freedom that we treasure today. Our American struggle for Independence not only established the idea of democracy for our country, but changed the course of civilization around the world as others followed suit. There are many heroes that come to mind with regards to our struggle for freedom, with our Founding Fathers and their Declaration of Independence being the center of our celebrations today. In 1777, the appeal of Independence and the valiant struggle by the American colonies was foremost on the mind of a 22 year-old London native. The young man decided to submit to the allure and adventure of what he called “the Glorious Cause of Freedom”. He sought to enlist on the side of the Americans in their struggle against his homeland. This man, who was so enamored with the concept of democracy and freedom, was Richard Booth, grandfather of the assassin John Wilkes Booth. “To John Wilkes, Esq., Princes Court, Westminster. Sir, — You will certainly be much surprised at the receipt of this letter, which comes from two persons of whom you cannot possibly have the least knowledge, who yet at the same time claim the Honour of being of the same Family as yourself. Our conduct has certainly been in some respects reprehensible, for too rashly putting in execution a project we had for a long time conceived. But as it was thro’ an ardent desire to serve in the Glorious cause of Freedom, of which you have always been Fam’d for being the Strict and great Defender, we trust the request we are about to make will be paid regard to. As Englishmen, it may be urged that we are not altogether Justified in taking arms against our native Country, but we hope such a vague argument will have no weight with a Gentleman of your well-known abilities; for as that country has almost parted with all its Rights, which have been given up to the present Tyrannic Government, it must be thought the Duty of every true Briton to assist those who oppose oppression and lawless Tyranny. And as the people of America are composed of men who have still the spirit of their brave Forefathers remaining, it becomes all who are Englishmen to exert their utmost efforts in their behalf, leaving their Country for that purpose; being no more (as we presume) than the Romans, in the war between Octavius and Anthony on the one part, and those illustrious worthys, Brutus and Cassius, on the other, going from the army of the Tyrants to serve in that of the latter, and therefore equally justifiable. The manner in which we have conducted ourselves has been so very extraordinary as to be scarcely credible, but we are assured the Bearer of this Letter will convince you of its Authenticity. In short, we left England, and all the advantageous prospects we had there, purposely to go and serve in the Army of the Sons of Liberty, the brave Americans. In order to complete the Enterprise we came from London under a pretence of going on a party of pleasure to the Camp at Warley Common, but instead of proceeding thither, we went immediately for Margate and thence to Ostend, and have since arrived here, where we came to wait upon the Gentlemen who are Agents for the Congress in America, in order to the full completion of our Design of getting appointed officers in the Provincial Service, but for that purpose have since found it necessary to procure a Letter of recommendation from some Gentleman in the Interest of Liberty in England, and understand from Mr. Arthur Lee (who has promised to interest himself greatly in our behalf), that no recommendation will be of more service to us than yours. Our request therefore is, that you will condescend to give one in our favour, directed to that Gentleman at the “Hotel de la Reine, la Rue des Bons Enfants, a Paris,” which you will please to deliver to the Bearer hereof, as soon as possibly convenient. And the favour will be gratefully remembered, and the name of Wilkes be always held in the greatest respect and veneration. Sir, — I cannot but express the deepest concern when I reflect on the Imprudence of my Son and Nephew, in taking the liberty of addressing you without your first being apprised of it and your approbation for so doing. My uneasiness is not a little heightened when I consider to what Length their unguarded youth may lead them, and the various expressions which their thoughtless Pens may have made use of. I must assure you, sir, nothing could be more foreign to mine and to their Mother’s inclinations, nor could anything stimulate them to it but their looking up to you as the sacred Protector of the greatest Blessing on Earth, fair Freedom, and your invariable struggles for the Protection of it. I cannot, however, but flatter myself that should at any Time a correspondence take place between you and Mr. Lee, and these two youths be the subject of it, that you would speak of them as children of those who stood foremost in Friendship for you, and who are not a little happy in the connection of Blood with which we stand.
. . . These youths, sir, have, as you are pleased to observe, to lament their not being personally known to you ; but I bless God, the best of characters can be had of them from Persons of the greatest merit and Fortune. In addition to this letter, John Booth, who was a silversmith, sent Wilkes a plate and assured him that he would be happy to use his influence to help Wilkes in any way possible. Richard Booth revered America and General Washington so much, he had Washington’s portrait displayed in his London home and would make visitors bow towards it. 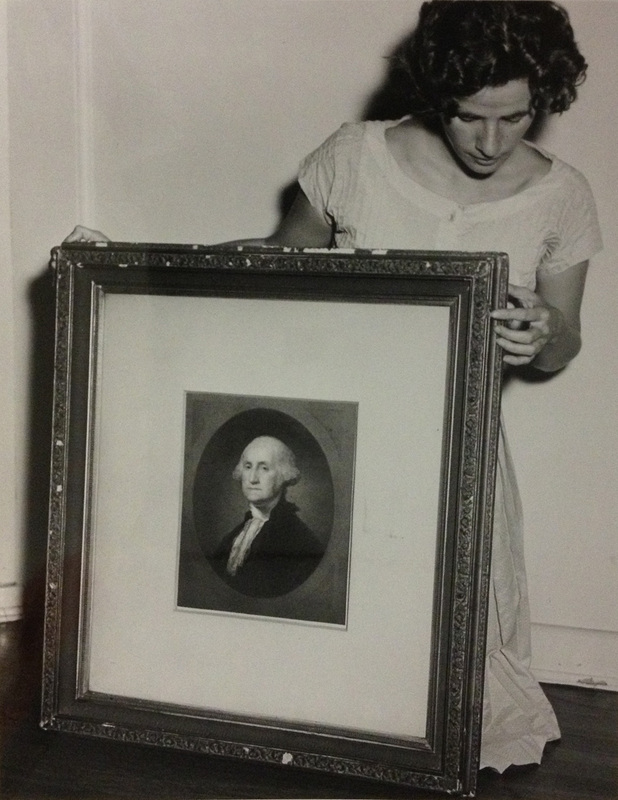 This portrait of Washington decorated the box at Ford’s Theatre when Richard’s grandson, John Wilkes Booth, assassinated Abraham Lincoln. In the years after his son Junius found fame and success in America with his “wife” Mary Ann Holmes, Richard felt confident to finally immigrate to the land he adored so much. He took up residence at the family home at Tudor Hall for a time, before finding his own lodging in nearby Bel Air. 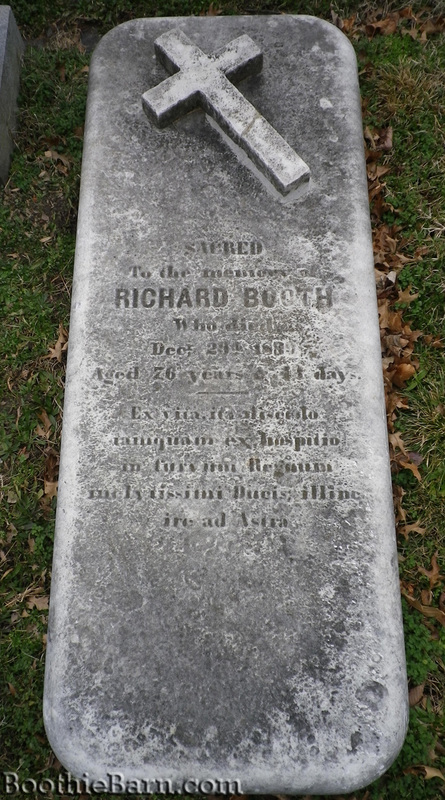 Today, Richard Booth, a man who truly loved the spirit and promise of American liberty, is buried in the Booth family plot in Baltimore’s Green Mount Cemetery. This would be patriot rests appropriately under the land that he forever held in high esteem.